Shelfspace Needed: Short absence because... city trip! I just wanted to notify you that I'll be gone from Sunday at oh-hell-no o'clock (otherwise known as 'your flight departs at 7a.m. so head to the airport at 5') in the morning until sometime on Wednesday. 'Gone where? ', you might ask. I'm so excited! :D Yes I live smack in the middle of Europe and the flight is less than two hours but I've never been to Spain before! I'll be going with my family (first time in over two years) and we'll see how that goes down, but my sister knows the city a bit and I'm honestly looking forward to some warmer weather. It's very snowy and cold here in Zurich at the moment. Brr. I don't own the picture, find it here. I don't own, find it here. Seriously, I love Gaudi's art! 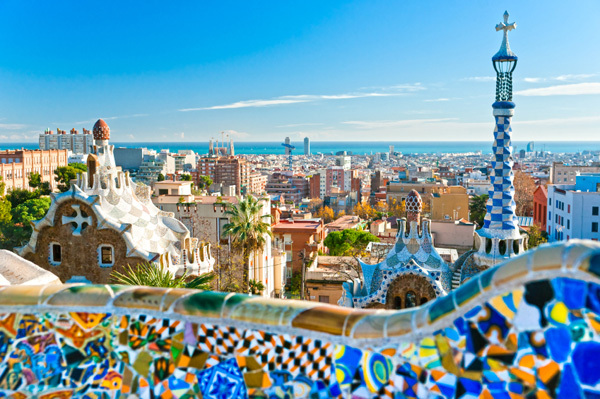 I've wanted to see the Sagrada Familia and the Park Güell for years :) According to my sister, there's also a great Old Town part with lots of little alleyways and boutiques and other interesting little shops. And of course the Rambla. We probably won't be going to the beach because alas, 'tis not the season. However, because of that it'll also be less crowded which is a plus in my book. Now what does this mean for you and this blog? Have a good start on Monday! Thanks :) Even the weather is looking good so far! And yes, I meant knock on wood >.< I just remembered that the saying also has 'wood' in it and then assumed it must be the same. Sometimes I mix up this sort of stuff because it's not something you can just translate across languages.